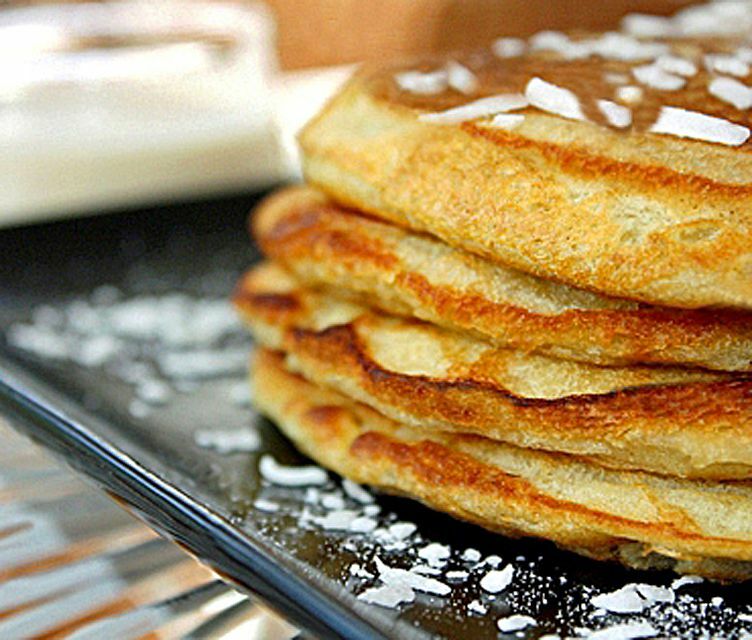 The best light and fluffy homemade coconut pancakes! These pancakes are so good, they may not make it out of the pan. Try serving them with a complementary coconut syrup (super-simple recipe included) for a trip straight to coconut heaven. In Thailand, coconut pancakes are a common street food, though different from the thick, fluffier pancakes we're used to here in North America. For this recipe, the two types are melded into a mouth-watering combination. Includes frying tips for great-looking pancakes you'll love to serve. In a medium-size mixing bowl, combine the can of coconut milk with the shredded coconut. Set aside. In a smaller bowl, whisk the eggs. Add the sugar then melted butter, and whisk again until light and fluffy. Add the egg mixture to the coconut milk mixture, stirring well to combine. Also, add the coconut flavoring (if using). In a large mixing bowl, stir together the flour, baking powder, and salt. Now add the wet coconut-egg mixture to the dry flour mixture, stirring well to combine. Heat a frying pan or flat-bottomed wok over high heat for 30 seconds (use a pan with a thick base, if you have one). Reduce heat to medium for another 30 seconds. Add 1 tablespoon oil and swirl around, then ladle about 1/4 cup pancake batter (for large pancakes) into the middle of the pan. Jiggle the pan a little or tilt to spread the batter out (if needed). When surface around is covered with bubbles, flip and cook the other side. Always add more oil when frying the next batch, or it may stick. Also, you may need to lower the heat as you go, or the pan might become too hot and burn your pancakes before they're cooked. Medium-low heat is best once your pan is good and hot. Simply combine the coconut milk and syrup, stirring well. Adjust the flavors by adding more coconut milk or more syrup depending on your taste preferences. Thai Recipes: Indulge in a World of Taste!